I'm switching my site files over to a new computer and upgrading my 10-year-old Dreamweaver 4 software, so things may be kind of wonky for a while. Hope your holidays are happy and the new year is good to you! I'm still here! It's been a very busy year on the home front. Like many of you, I've been helping aging parents downsize their lifestyle, and work has been extraordinarily busy. I spend my days as a writer and marketing analyst, so by the time I get home the last thing I want is more keyboard time. To better balance myself, I've been spending more time at the workbench, and to refresh myself I've been taking on some non-WWII projects for the first time in many years. I'm not abandoning the US army in WWII, but it's good to stretch and learn new things. Actually, I've come to appreciate this site even more, not being able to find its equivalent for the US military's operating in Iraq and Afghanistan. Roy Chow has faithfully updated his remarkable summary of WWII Sherman Variants, one of reasons this site has been cited by Steve Zaloga in several books in his Osprey modeling series. Another reason is Gary Binder's Modeling the WWII Sherman Tank, a great overview of the vehicles that serves as a companion piece to Roy's article.. I have added a couple reviews that have been on the shelf for a while. Cookie Sewell speaks highly of Dragon's M4A3(76)WETO, which is more new parts than old for a change. And I picked up Zaloga's very informative Armored Thunderbolt and his highly instructional Modeling US Armor of World War 2a book I wish I'd had 20 years ago! There have been many new products issued or announced over the past few months. If you've picked up Bronco's new 155mm howitzer, you might want to check out my build article on the old Peerless Max/Italeri/Testors kit for historical information. Likewise, owners of the recent AFV Club 105mm howitzer may want to see how it compares to the kits from Dragon or Italeri. Speaking of old kits, they still serve a purpose for bringing younger kids into the hobby, being simple to build and relatively inexpensive, if not always the most accurate. Many years ago, my son and I assembled the old Monogram Weasel. This month, I'm working on LZ Model's new resin kit. Stay tuned! Time flies when you're having fun! Well, it hasn't all been fun. March and April were consumed with a lot of overtime at work, and any free time was spent at the bench working on some projects and making final preparations for the Minnesota Military Figure Society's Boots and Treads II show, which I chaired and was held in May. 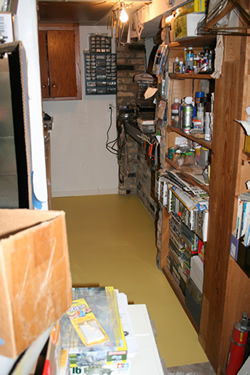 Since the show I've been focused on my "infrastructure," having finally painted the concrete floor of the disaster area known as my "studio" a bright clean yellow to make it easier to find those small parts that escape my grasp. And I'm building a new spray booth out of a kitchen cabinet discarded by a neighbor. I need to update some kit lists with new products that have arrived or been announced over the past few months. I did pick up Steve Zaloga's Armored Thunderbolt and Modeling US Armor of World War 2 (what a catchy title!) and I'll try to post reviews by the end of the month. Stay tuned! 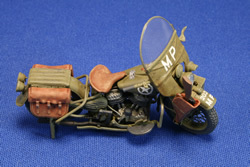 I finished painting and weathering MiniArt's Harley Davidson, and added some Archer Fine Transfer decals to my Italeri Harley to complete it. Evolution Miniatures was kind enough to send three excellent figure sets my way for review: American Ranger WW2, American Marines WW2 Pacific Ocean, and American Marines WW2 Pacific Ocean (Machine Gunners). Cookie Sewell offers an in-box review of Dragon's new 105mm Howitzer M2A1 and Carriage M2A2 w/USMC Crew. I've also taken this opportunity to update the 105mm Howitzer Ordnance - Kits, Upgrades, and Accessories page. A lot of stuff has come out recently! Well, I decided to give myself a month's vacation from updating the site. 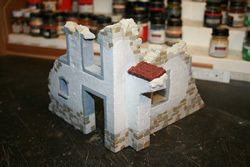 At the stroke of midnight on January 1, I started on the diorama for my Sicily Priest. You can see the base coat on Verlinden's old Italian Farm Ruin at right. My New Year's resolution is to finish the dioramas for this and the Belgian Priest and some other uncompleted projects.